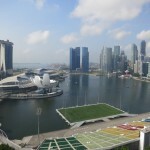 Singapore is one of the world’s best cities but we often dismiss it. Even in the region Singapore doesn’t have the allure of Hong Kong, the excitement of Bangkok or the beaches of Bali. It doesn’t have the mystery of Myanmar, the temples of Cambodia, the affordability of Vietnam or the food of Malaysia. What Singapore offers is pretty much a beautiful, safe, clean, modern empire of everything good. 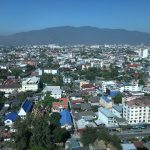 It is a truly world-class city with top hotels, airport, airline, restaurants, bars, attractions, events, street food, and a true mix of cultures. Basically, Singapore has it all and I love spending time there. I’ve honestly been to Singapore a dozen times more or less since I first visited back in 1999. It has changed like few other cities have in that time. 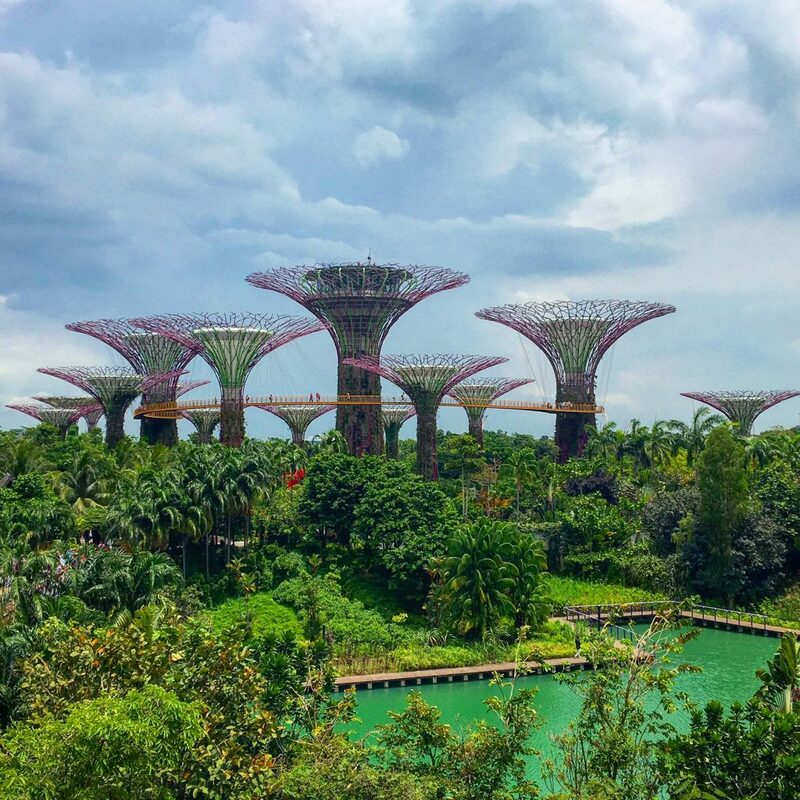 Singapore has evolved into one of the best countries to live in the world. It has a massive expat community, high incomes and some of the best infrastructure around. But again, people often dismiss it. Why? I think that people dismiss Singapore because they almost take it for granted. It’s almost too nice. It’s too expensive in a region where things are so cheap. It’s not this or it’s not that. 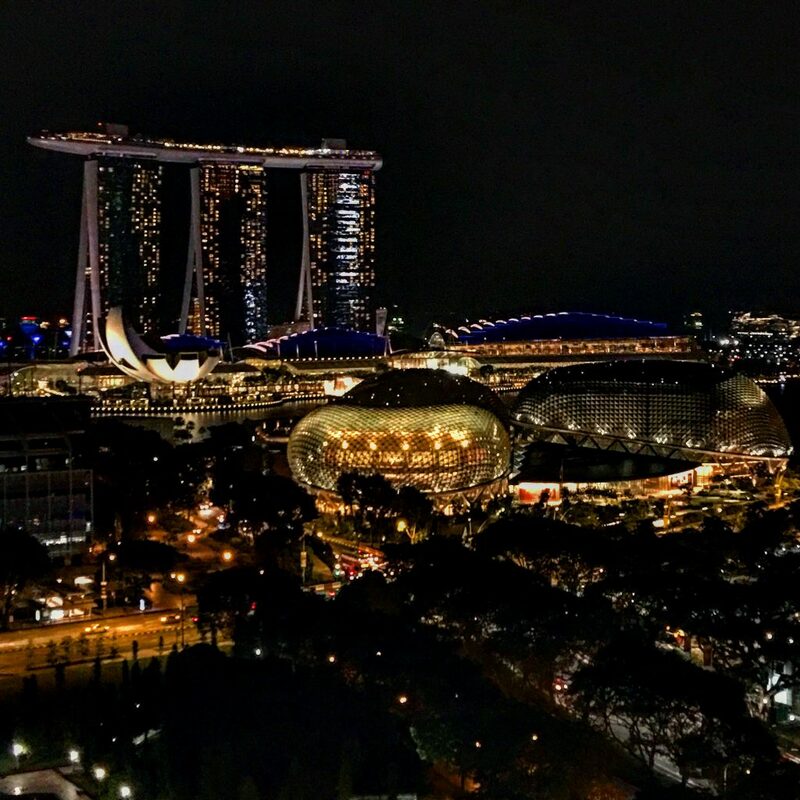 You can compare Singapore with anywhere in Asia and you’ll always come to whatever conclusion you want but the bottom line in Singapore has it all and does it as good as anywhere in the world. 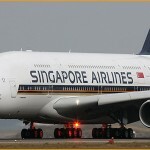 After a few weeks doing a tour of luxury villas in Thailand and my first trip to Chiang Mai I was thrilled to be back in Singapore. 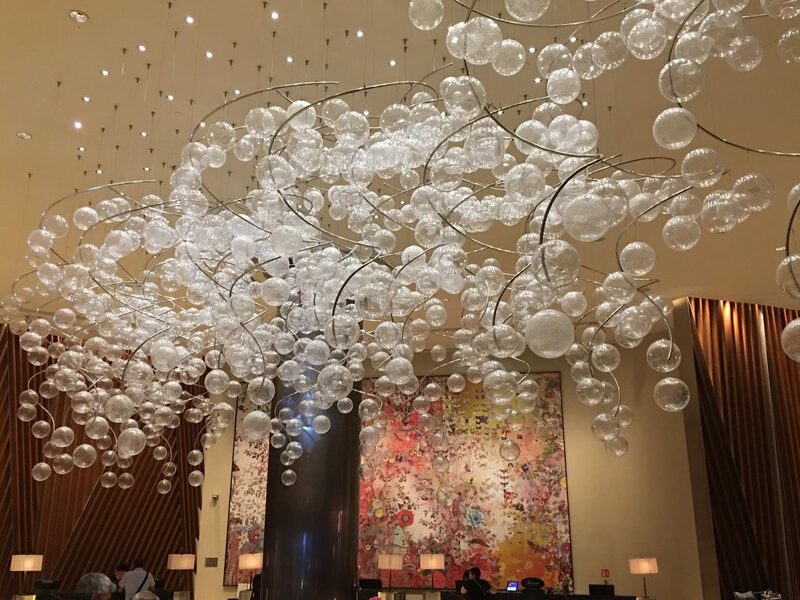 I stayed at the Fairmont Singapore Hotel. It’s a newly renovated property right in the heart of the city just off Marina Bay. It’s across from the famous Raffles Hotel and attached to the massive Swissotel. 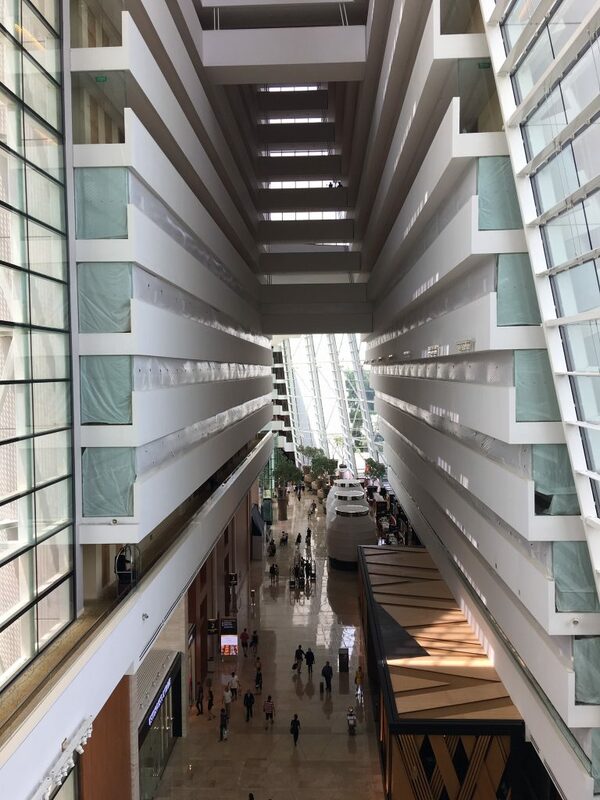 I arrived late in the afternoon on a Friday, checked in, showered, admired the view from my room for a hot second and went down for a meeting in Antidote; the new lobby bar at the Fairmont Singapore. The entire lobby was recently redone and opened up. It’s actually super nice and colorful with striking art and glasswork somewhat reminiscent of Bellagio in Las Vegas. Cocktails are a big deal in Singapore these days. 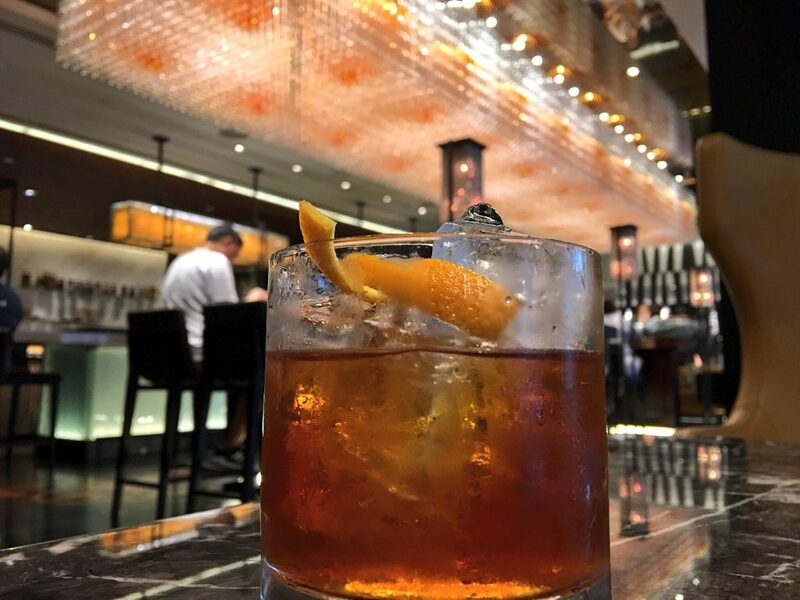 In fact, Singapore is home to 3 of the 50 best bars in the world. 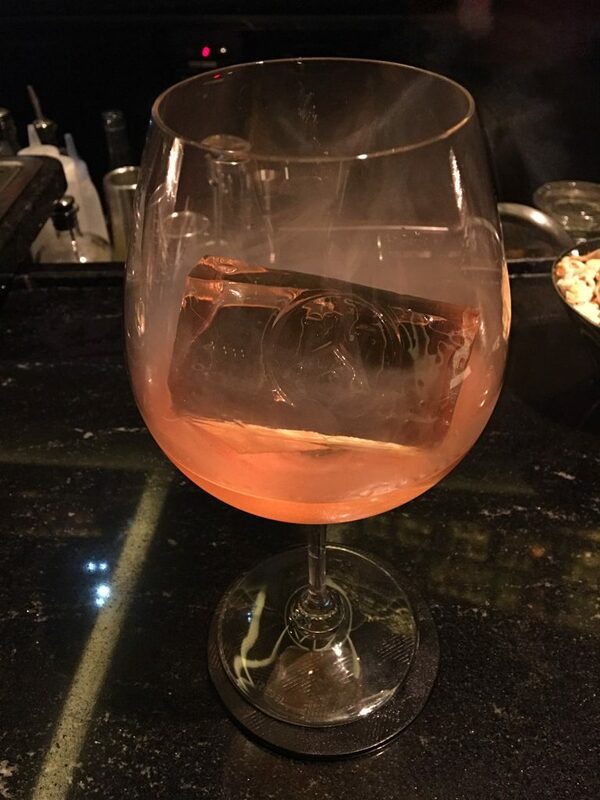 So I picked my poison carefully and went with a fantastic play on an Old Fashioned-perhaps my favorite cocktail if done properly. 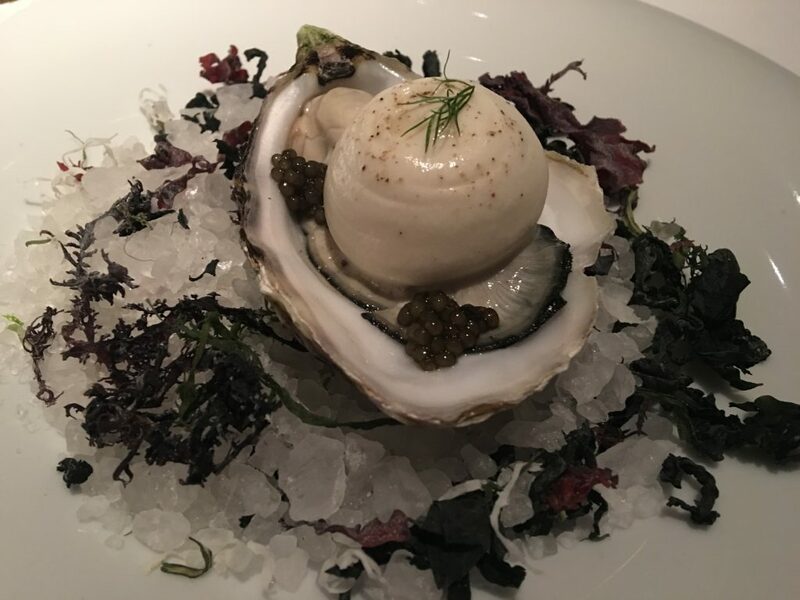 After a few cocktails it was up to dinner at Jaan. 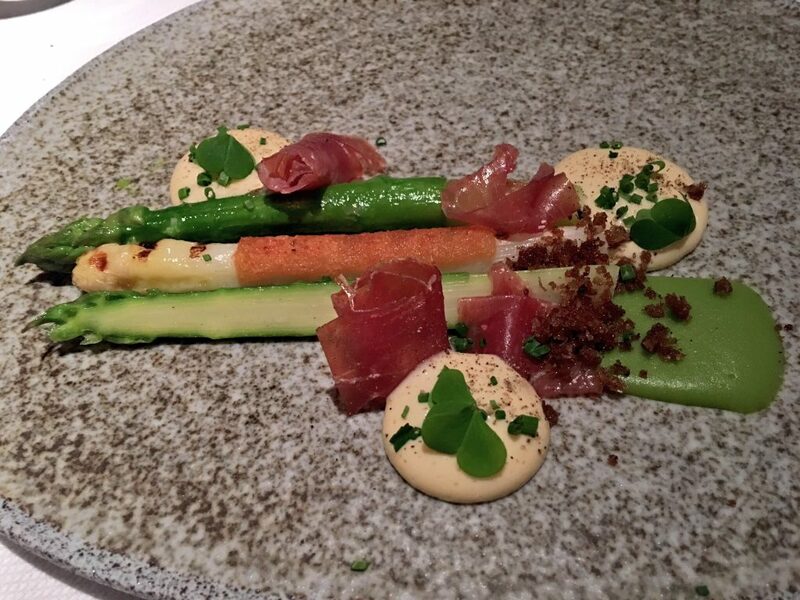 Jaan is a Michelin Star restaurant and one of the 50 best restaurants in Asia. It is located at the 70th floor of the Swissotel and has one of the best views in all of Singapore. Sadly for me, I arrived when it was raining so the view was obscured but still pretty darn good. The food at Jaan was to die for. 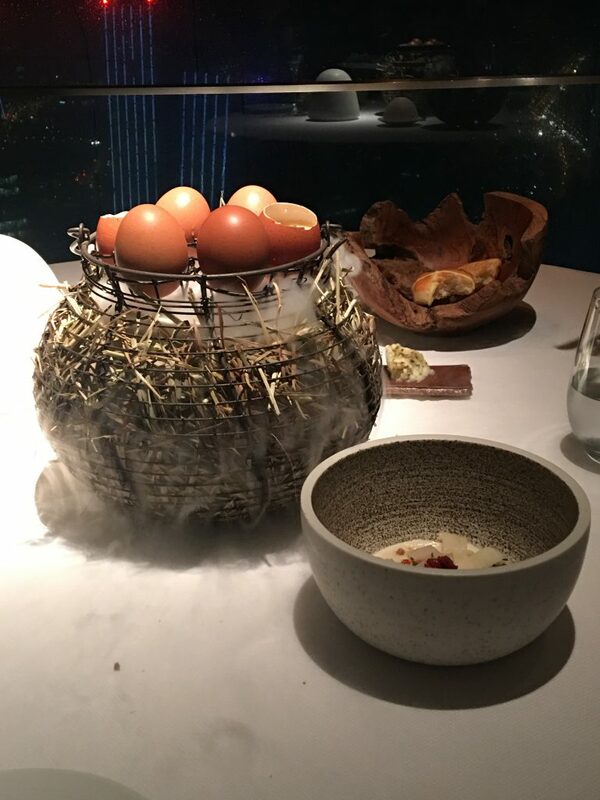 It was a 10+ course tasting menu where each course was better than the last. We literally had a 4-hour dinner, as is often the case at these super fancy tasting restaurants. But with food and drinks this good, who would mind? Saturday I spent most of the day sightseeing around Marina Bay and sampling some of the local street food. 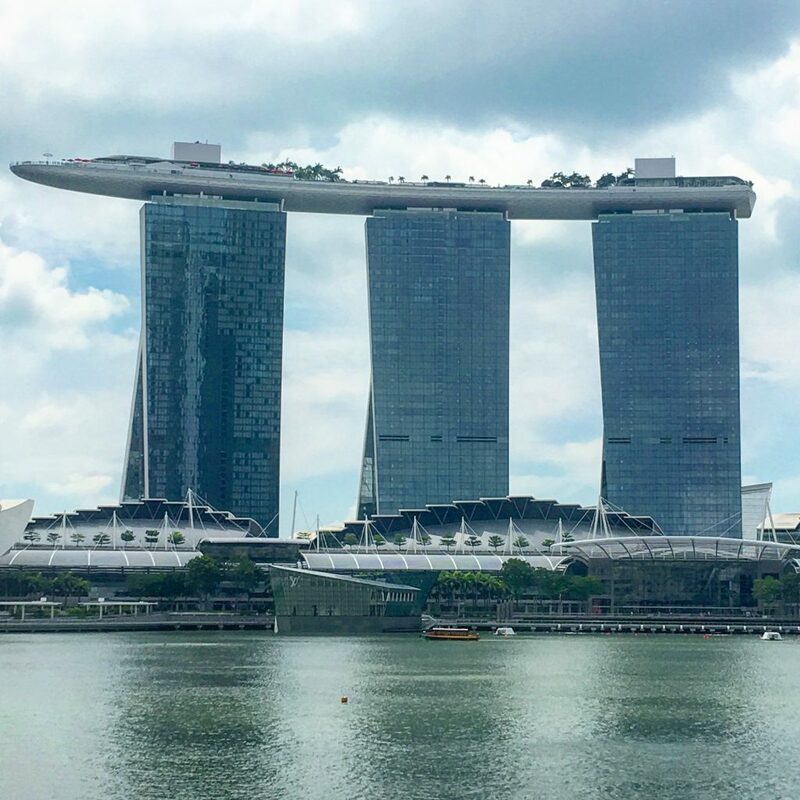 Marina Bay has become one of the world’s best skylines. There is a great downtown CBD, if you will. 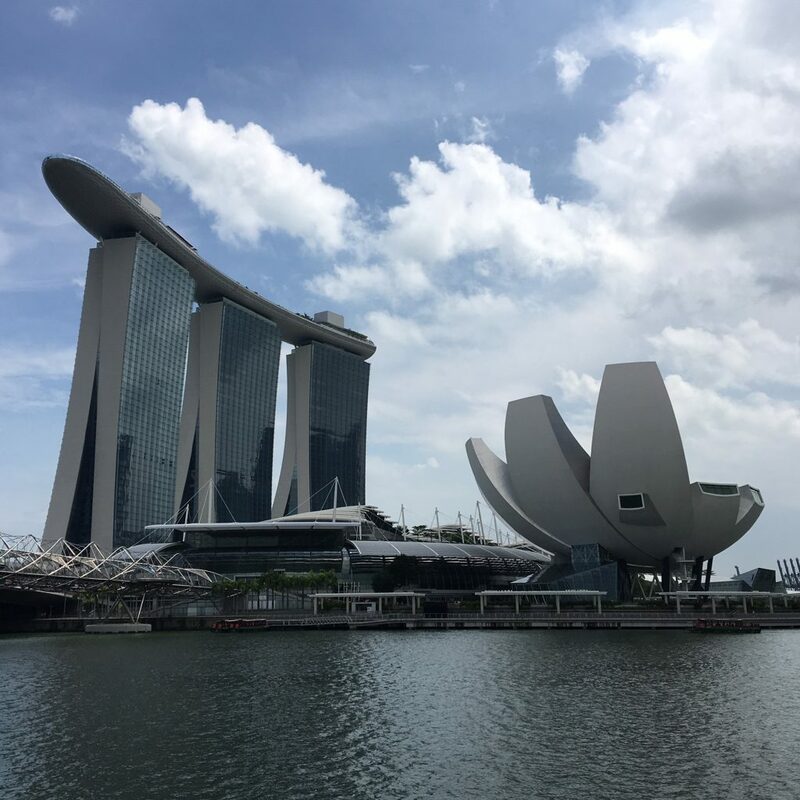 The marina itself is lovely and it’s all flanked by the striking Marina Bay Sands; which has quickly become one of the most famous buildings in the world for architecture. 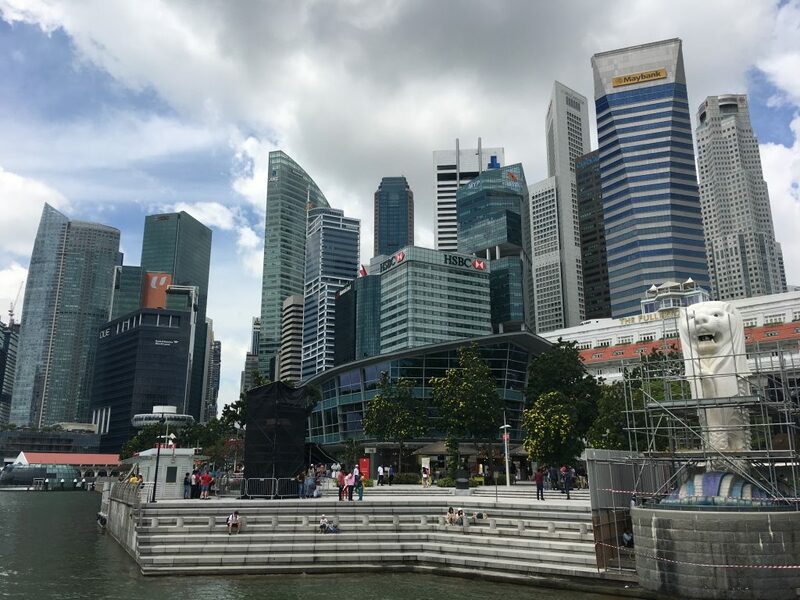 But because it’s Singapore and many people dismiss it, I find that Singapore and its skyline are never mentioned in the great skylines of the world. I feel it’s right up there with New York, Hong Kong, Chicago, Shanghai and Dubai. But most Singaporeans would prefer the secret be kept a secret. During dinner at Jaan, I found out that Saturday night there was going to be a Guns N’ Roses concert in Singapore. GNR is probably my favorite band of all-time or certainly right there with Metallica, Motley Crue and the Rolling Stones. I was beyond excited and my Saturday evening plans changed immediately. There was no way I wasn’t going to the show. 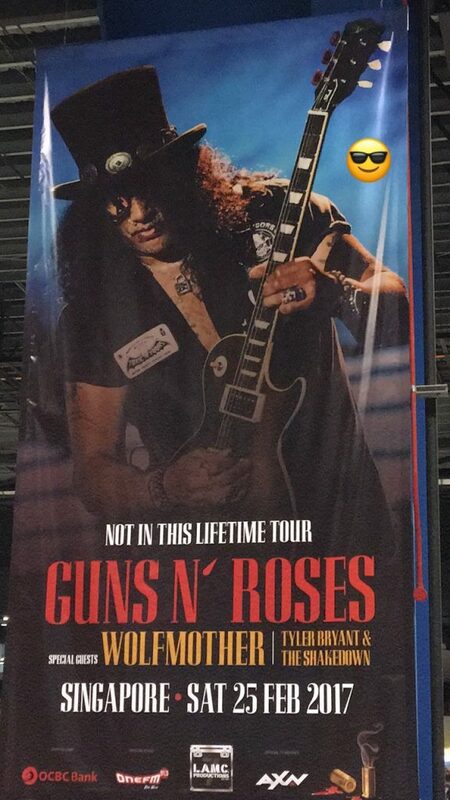 Guns N’ Roses launched the ‘Not in This Lifetime’ tour last year in North America and I swear every single date worked against my schedule and I was devastated that I couldn’t see them. I had seen GNR before but when they had a skeleton crew of Axl Rose and a bunch of random guys. So with Slash and Duff back in the band I was so excited. The concert was held out at the Changi Exposition Center out by the airport. It was an outdoor concert with the concessions etc. inside. The venue itself was whatever and the way they sold drinks was a disaster but the concert more than made up for it. 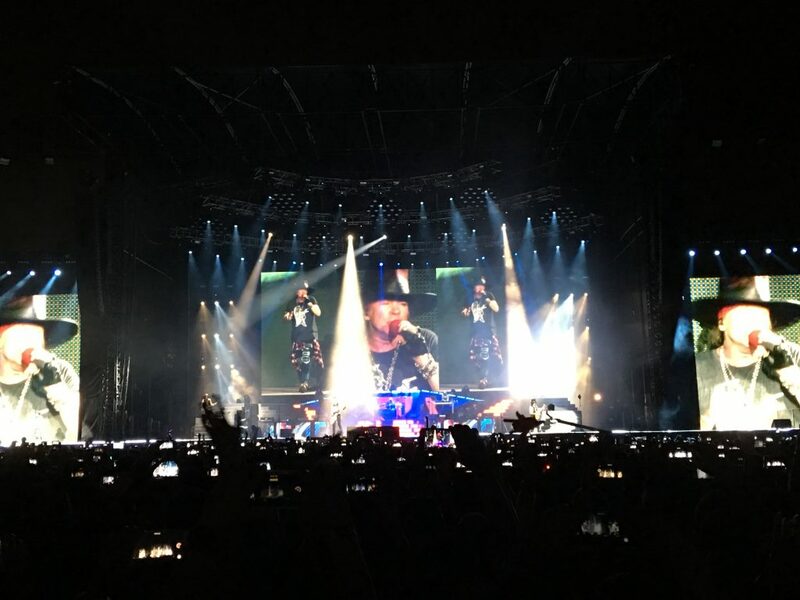 Guns N’ Roses rocked Singapore to its core for 3 hours. Axl didn’t look great to be honest but he sounded awesome and he was as charismatic as ever as front man. They played almost everything from ‘Appetite for Destruction’ including opening with ‘It’s So Easy’, ‘Mr. Brownstone’ and ‘Welcome to the Jungle’. 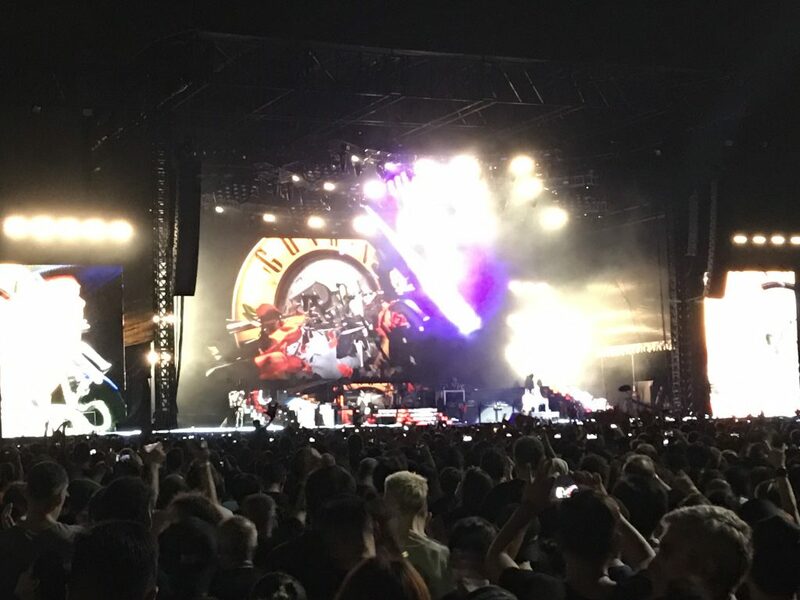 Later on they played ‘Out Ta Get Me’, “Nightrain’, “Rocket Queen’, ‘Sweet Child O Mine’ and Paradise City’. They crushed it. Obviously they played a bunch from both ‘Use Your Illusion’ albums and ‘Patience’ from GNR Lies. They played a few songs from ‘Chinese Democracy’ but I never really got into that album once the original band split up. Regardless, it was a dream for me to see them in Singapore and a true coincidence. Normally I am all over stuff like this be it sporting events, concerts and major events and I plan ahead. This was a pleasant yet complete surprise! I love when that happens! After the show, I grabbed some street food as I was absolutely starving. 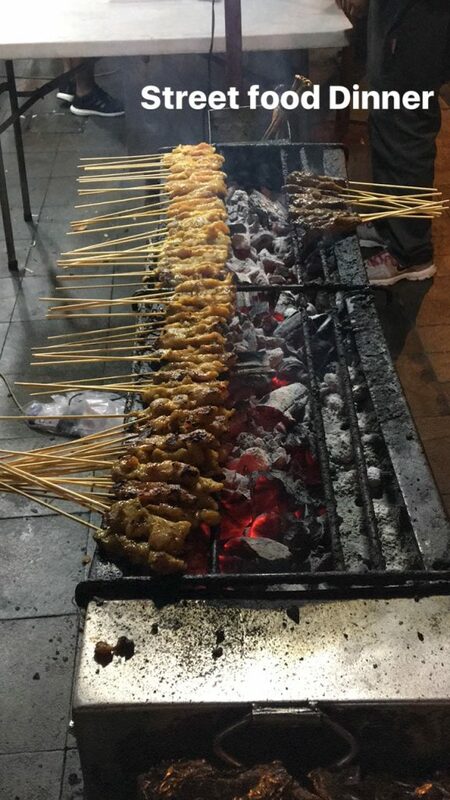 In the night markets in Singapore you can pretty much find whatever you want from Asia. The hawkers are excellent, the places are clean and they do a great job. 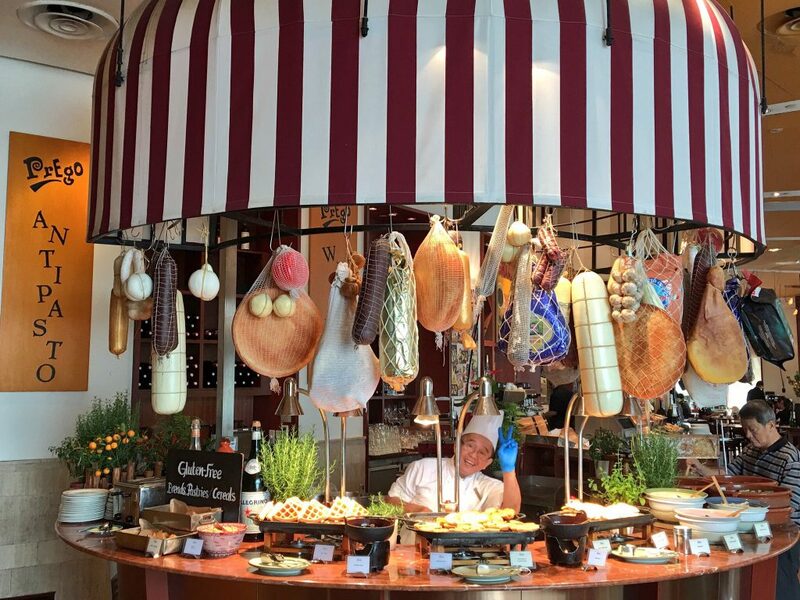 Sunday I woke up late and had breakfast at Prego in the Fairmont Singapore. It doubles as an Italian restaurant for lunch and dinner and is a very popular place open to the public. I then walked over to Gardens by the Bay. I went there back in 2012 as part of a preview group during my last trip to Singapore where I stayed more than a few hours in transit. It is a pretty cool place to see but it doesn’t blow your doors off or anything. 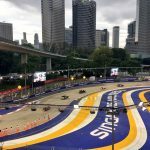 The best part about it from my perspective is it gives a great foreground for pictures of Singapore’s skyline and the Marina Bay Sands. It can also be hotter than hell out there expect to sweat! There is a bridge that connects Gardens by the Bay to Marina Bay Sands. You can check out the lobby freely and you can buy a ticket to the enormous rooftop if you choose. I didn’t do it this trip but I went up to the pool back in 2012. It was pretty awesome to be honest. 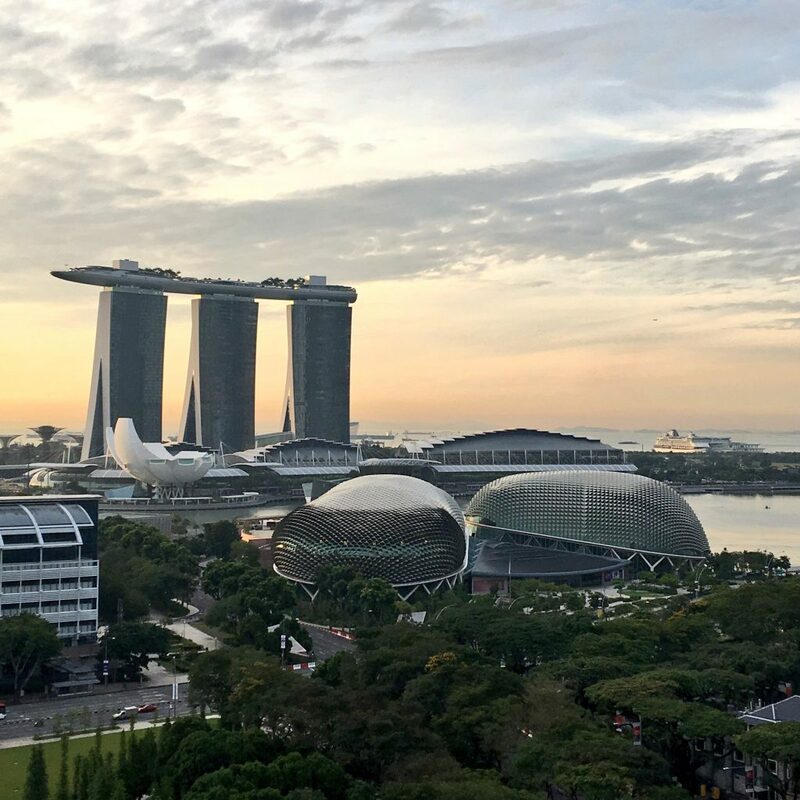 Also connected to Marina Bay Sands is a whole modern complex of art, restaurants, shopping and public space. 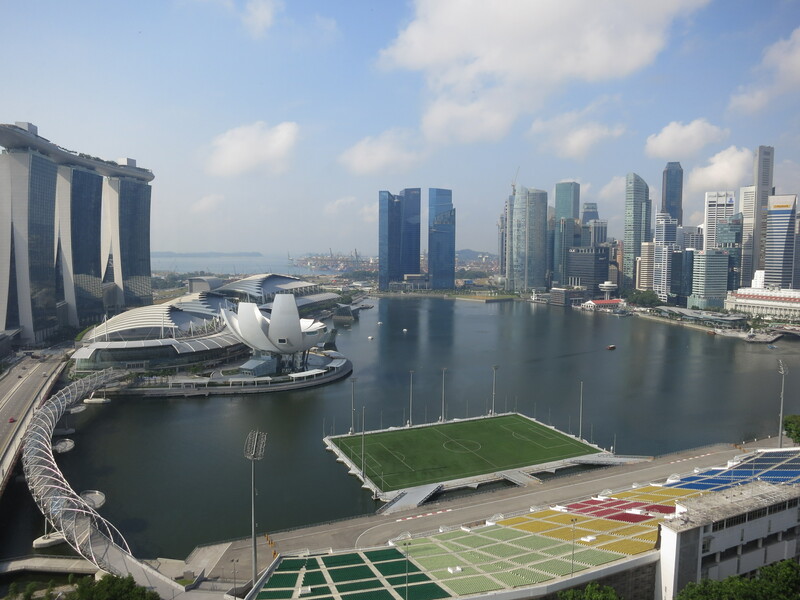 It’s Singapore so everything is immaculate and the views of downtown are excellent. After sufficiently sweating through my shirt I headed back to shower and relax. As I mentioned earlier, Singapore is home to 3 of the 50 best bars in the world. My plan was to do a little evening cocktail tour before dinner and my 6am flight home the next day. What I didn’t do, however, was look at opening hours. It turns out that 2 of the 3 are closed on Sundays. That was my bad obviously for poor planning but I will be back in September and will go to the other 2 then. I did go to Manhattan at the Regent. 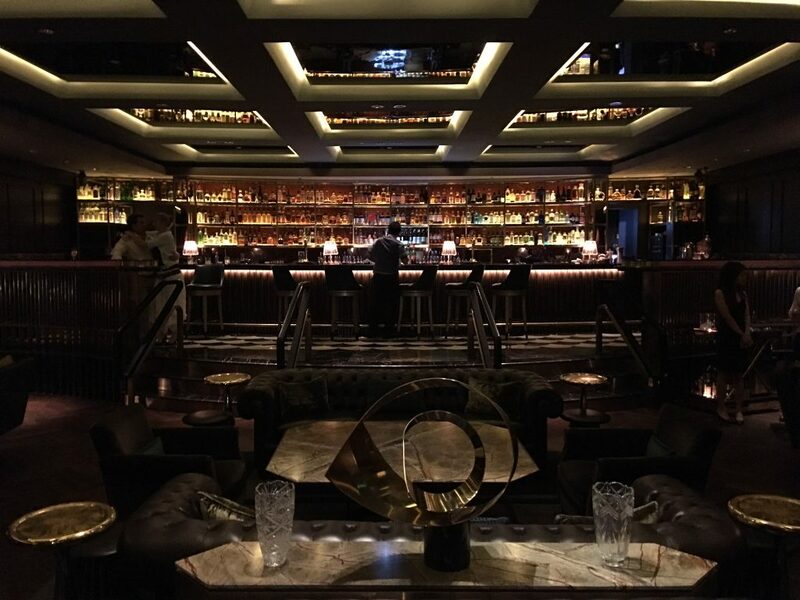 It is ranked #11 on the list of the 50 best bars in the world. You may recall I went to several on my perfect trip to London back in January. There are 9 in London, 8 in New York and 3 in Singapore. That’s not too shabby for Singapore! The bar was excellent, very high-end with knowledgeable bartenders who take their cocktails seriously. I love that. I love sitting at the bar, chatting with them and watching them create their masterpieces. Drinks at Manhattan are actually pretty reasonable (I say this as a New Yorker where everything is expensive) considering the cost of drinking in Singapore is quite high. I look forward to visiting Operation Dagger, 28 Hong Kong Street and a new cocktail bar that just opened called Atlas. The former bartenders at Artesian in London opened this; which formerly was the #1 bar in the world for several years in a row. Now since Artesian lost its prized talent to Singapore, the bar fell from #1 to off the list completely. As you can tell I am fascinated by this bar list! Anyway so Singapore has it all. It really does and in 3 days I didn’t even scratch the surface. I didn’t get a chance to get out to Sentosa, check out the Arab Quarter, indulge in nightlife or visit any museums. 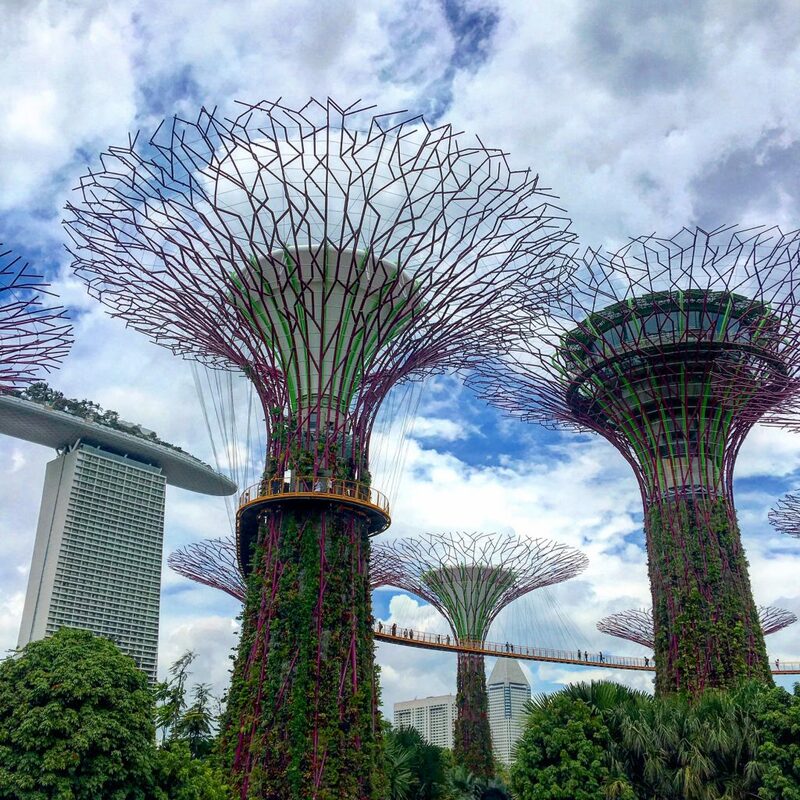 I have done that all in the past but Singapore is ever evolving and each time you visit, there are new things to see and old things that have been improved upon. Singapore has it all I am telling you and it is awesome. I love Singapore! We lived there for 2 years while my husband was on a contract. 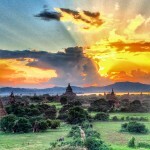 It changed my life completely and I long for the joys of exploring a region as diverse and exciting as Southeast Asia. Singapore was the perfect base and enough like home where you never really felt like a foreigner. I am living in Singapore now since two years,it’s a awesome city . Here are lovable things in Singapore. Thanks for such type of great post.